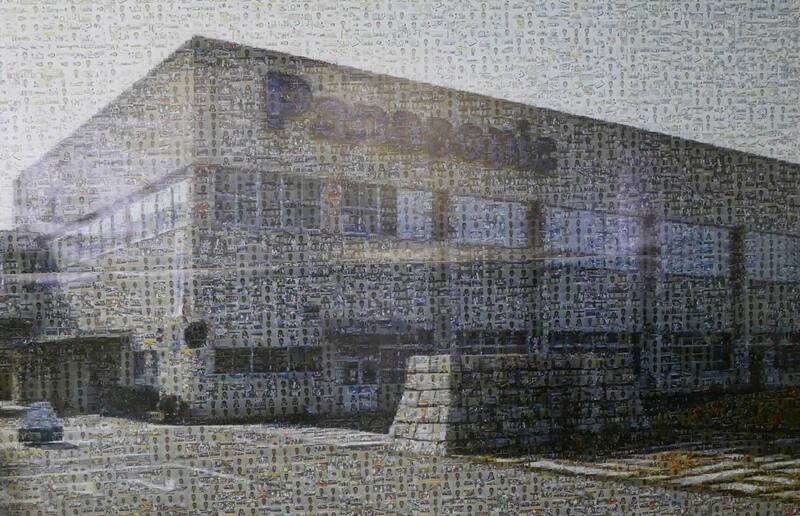 Panasonic’s professional video in Okayama — composited from portraits of every employee. In January 2012, Panasonic’s professional video factory moved to Okayama, 180 km (111 miles) west of Osaka. The picture above was composited from portraits of every employee. At Okayama, the entire manufacturing process from parts mounting to final assembly takes place on a single floor. This layout improves logistics and speeds production. The new factory has gigantic clean rooms for assembly of optical units in the cameras. Panasonic controls the entire process—making everything from the sensors and optical assemblies to the circuit boards, mechanical parts, housings, and components. It’s a one-hour train ride from Osaka to Okayama, past pampered beef in the city of Kobe, and the ancient pottery and sword workshops of Bizen. Bizen ware is known for its reddish brown color and extreme hardness. The pottery kilns and sword workshops date back to medieval Japan. From Okayama station, it’s a short taxi ride past rice fields and Okayama Castle. Okayama Factory Manager Ryouji Hirota welcomed us with an explanation of the main products built there: professional and consumer camcorders, recorders, switchers, and of course, the new VariCams. Optical technology encompasses everything from raw glass to polishing, coating, assembly, inspection, and alignment. Mechanical and electronic production involves everything from molding and machining to construction and testing. Mr. Hirota pointed out the extremely high level of skills demonstrated by the employees: 538 Meisters with more than 10 years’ experience and a National exam, among 2791 with special production certificates. With that, the factory tour began.